I absolutely love this recipe from Lori Lange, author of the blog Recipe Girl. Lori is a talented food blogger and an all-around terrific person. She’s also the mother of up-and-coming food blogger Recipe Boy! I’m super excited about Lori’s upcoming cookbook (details below). I just love her creative recipes ideas. Here, she’s taken a simple, natural side dish and made it delectable with the addition of fresh sage and pine nuts. Hello Tori’s Readers! I’m Lori Lange, the blogger behind RecipeGirl.com. I was an elementary school teacher for many years before leaving the classroom to stay home, take care of my son and start a website based on my passions for recipes and entertaining. Nowadays, I share recipes and entertaining menus with my RecipeGirl readers, and I just finished writing my very first cookbook: The Recipe Girl Cookbook, which will be published on April 15th- a dream come true! I live a crazy, busy life in sunny Southern California with my husband and 11 year old food blogging and sports-addicted son, but I absolutely love every minute of it. I lived in small-town Carson City, Nevada for most of my childhood. I knew of only one Jewish boy in my high school, and I remember talking to him about the Jewish holidays, but I never understood any of it. In college (San Diego), I had the opportunity of working at a private Jewish school for a few years while I was getting my teaching credential. It was there that I finally gained knowledge and insight into the Jewish religion and holidays. I sang songs and said prayers along with the kids, I attended Bar/Bat Mitzvahs, and my friends set me up on dates with nice Jewish boys. A loaf of Challah bread came home with me every Friday, I sampled delights such as sufganiyot, latkes, kugel and brisket, and I got in trouble once for bringing a shrimp-flavored Cup-of-Noodles into the staff lunchroom (oops!). I never did marry a Jewish boy, but I’m thankful to have had the opportunity to learn so much about the Jewish culture. 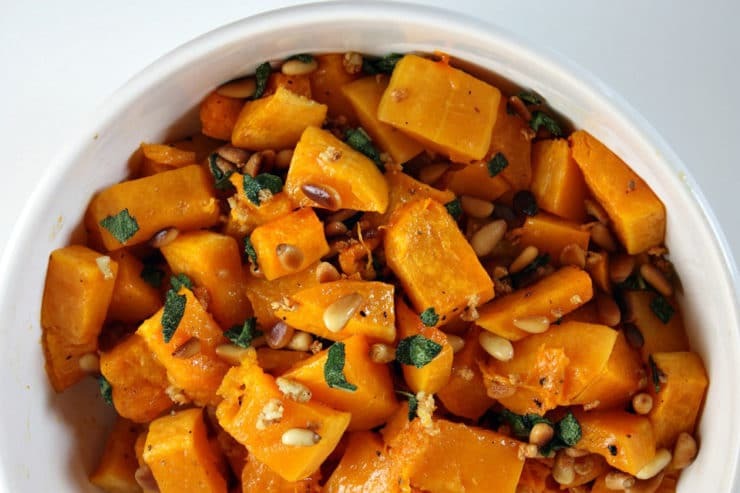 This Passover-friendly dish is one of my very favorite recipes: Roasted Butternut Squash with Garlic, Sage and Pine Nuts. 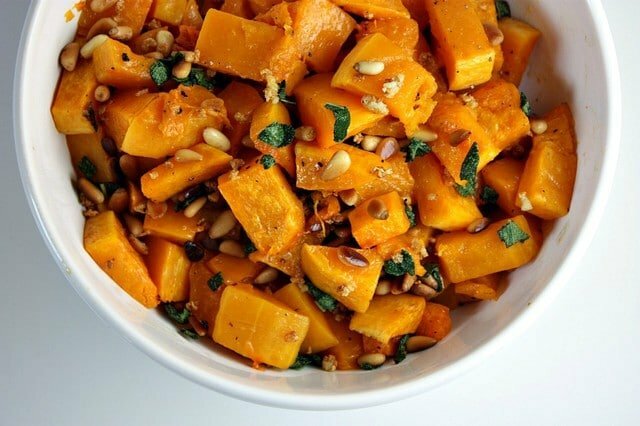 When Butternut Squash is roasted, it turns into a such a sweet treat, and therefore that makes it totally irresistible. In this recipe, I toss the roasted squash with sauteed garlic, sage and pine nuts. It’s my favorite thing to have for lunch, but it also makes a wonderful side dish. Happy Passover! Preheat oven to 450°F. Line baking sheet with parchment paper, or spray lightly with cooking spray. 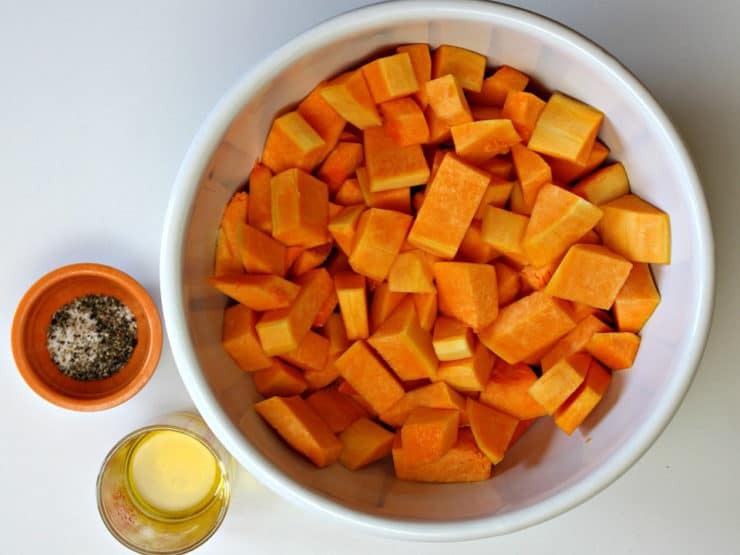 In a medium bowl, toss butternut squash cubes with 1 1/2 tbsp olive oil, salt and pepper. Spread out on prepared baking sheet. 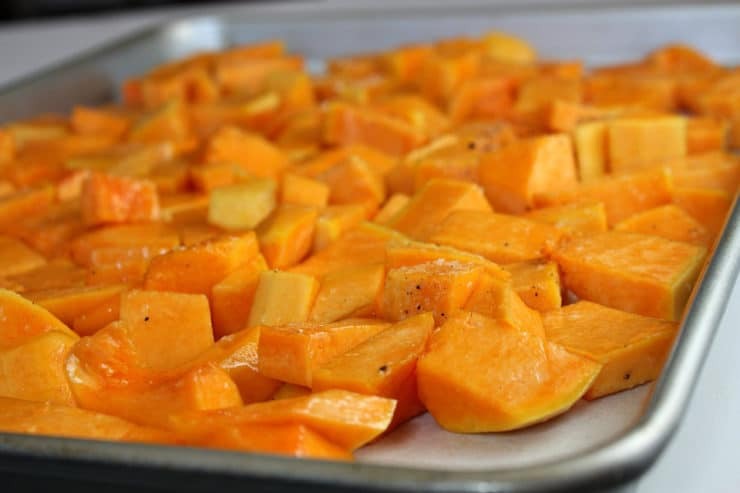 Roast for 35 to 45 minutes, until squash is as tender as desired. While squash is roasting, heat 1/2 tbsp olive oil in a small skillet. 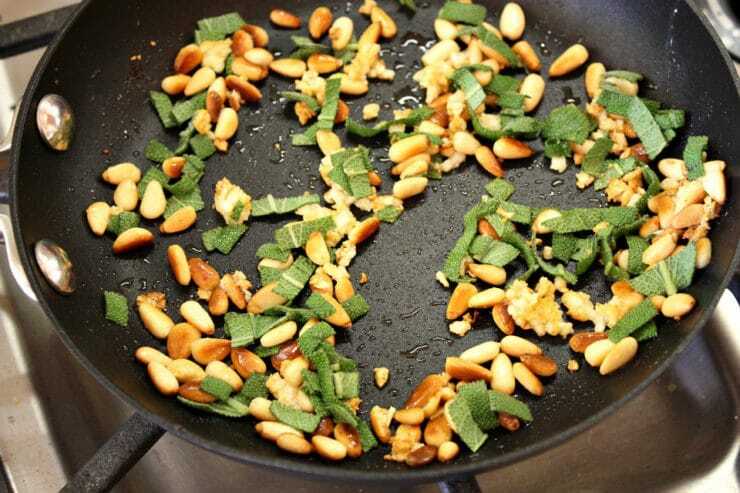 Add garlic, sage and pine nuts, and sauté until pine nuts are lightly browned. Remove from heat. 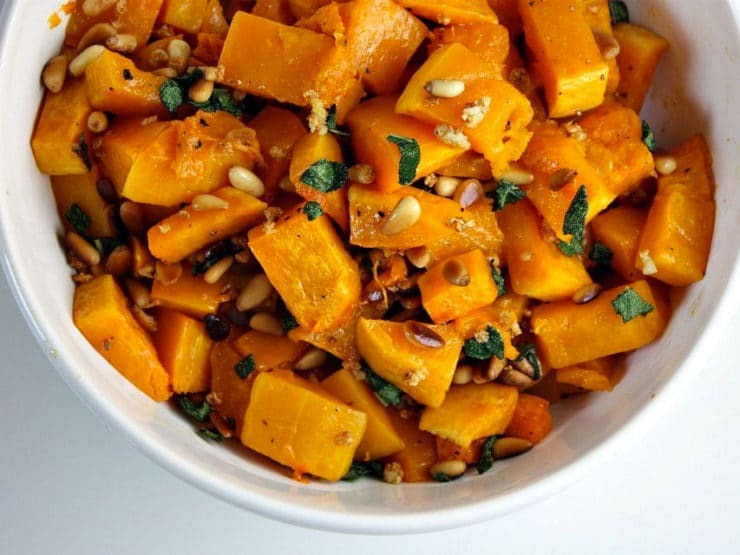 Scoop butternut squash into a large bowl. Scrape contents from the skillet onto the butternut squash and gently toss. Serve immediately. This is my go-to whenever I need to impress a group. I sub pecans in for pine nuts, and have started adding an extra clove of garlic. I usually broil it at the end for a bit of texture, as well. Great recipe! Hi. Can this be made ahead and frozen? Would like some side dishes that I can freeze and take on an airplane. I’m planning on making this dish ahead & re-heating it right before I serve it. If I do this, can I put the pine nuts in and re-heat them or should I wait until the last minute to add the nuts? oh, by the way I made your smoky potato-leek soup & it was delicious!!!! Hi Vivian– you can put the pine nuts in ahead and reheat them, no worries. I’m so happy you liked the potato leek soup! Chaya I think you could sub fresh thyme here, or even parsley. The flavor won’t be the same but both options will be tasty in their own way. Pepitas (roasted pumpkin seeds) are a great sub for any nut allergies! Can usually find at health food or finer grocery stores. That’s true Deidre, however some people with nut allergies are also allergic to pine nuts. Better to be safe than sorry! I made this for our Seder and it was incredible! I made it ahead and reheated and it…came out delicious!! Great recipes!! Thank you and Happy Passover! Fabulous Reli, thanks for reporting back! Help! I bought frozen butternut squash (I know, I know…) and since it comes in very small cubes, I didn’t roast it but put it in the pan with the oil, garlic, sage. and pine nuts. Needless to say, it isn’t as tasty as the roasted one. What can I add? Thank you! I love the above recipe, but for Passover, could you publish something that is delish, but can be made is advance. Since I will be sitting at the table with our guests, reading the hagaddah, it is tough to leave and prepare a dish such as the butternut squash above. My soup will be on the stove, my brisket warming in the oven along with the mashed potatoes, so I am looking for a veggie dish that can be made ahead and left to be served at room temp. Thanks! Also, keep in mind that Passover is a week-long celebration, so you don’t necessarily have to serve this dish at the Seder… it would make a great weekday dish, too! How would this taste without the pinenuts? I am thinking ok, since we have a nut allergy in our household. This is Lori’s recipe, but I am sure it would be great! You might also try toasted sesame seeds as a sub.